We now have a Faceplant page where we list all manner of old stuff nobody would ever want to buy. We add more mouldy stuff here frequently, so if you're into that sort of thing, check back often. how to find the most comfortable and efficient riding position for you. That's right, YOU, not anybody else. Click here to read about Schmidt hub dynamos and various battery powered lights. Our SON hub dynamo powered light systems are very efficient, environmentally clean, provide lots of light, and work in all weather conditions. Your bicycle can replace an automobile for most of your day to day transportation needs. Stronglight chainrings, headsets, fenders and bottom brackets. Pitlock Is Here! Quick release skewers on your wheels make them easy to remove, which is great when you have a flat, not so great when a thief targets your bike. Pitlock locking skewers will make a thief look elsewhere. TA Carmina cranksets in a wide range of arm lengths and chainring options. We have these in Single, Double and Triple sets. If you want to mix Campy and Shimano derailleurs, try a ShiftMate. Beautiful touring bags, carbon fiber fenders and stainless steel fenders from Gilles Berthoud. Under no circumstances should you place an order without reading this first. This web site can only be viewed with a computer. So, if you're having trouble viewing this site, and don't have a computer, that could be the reason. 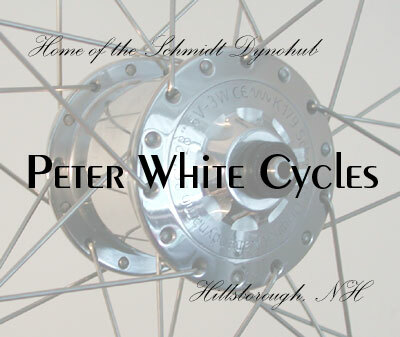 Peter White Cycles LLC is a small custom shop specializing in wheelbuilding, lighting systems, touring and commuting bikes and equipment for tandeming, touring, commuting and randoneuring. We import bicycle lighting products from Germany and France. We are also a wholesale distributor for several manufacturers of fine bicycle components for racing, touring and commuting, selling them to other retail shops in the US and Canada. We also build wheels for other bicycle shops and manufacturers. When you call, you'll either talk to me, Peter, my wife Linda, or one of our employees, either Sheena or Penny. If anyone else answers, it's party time. I've been in the bicycle business since 1975, started Peter White Cycles in 1988, and got onto the web in 1997. Linda joined the business in 2002. Sheena and Penny joined us in 2006. In the US and Canada, Peter White Cycles represents Wilfried Schmidt Maschinenbau, Busch & Müller, Spécialités TA, Stronglight SA, Tout Terrain, Pitlock, Rohloff AG, Sanyo, Supernova and Spanninga, Velocity, Wheelsmith, Wippermann and Sapim. Bicycle shops and bicycle manufacturers can order products from these companies through us. See this page for details. Consumers can find a list of bike shops across the US and Canada that purchase these products from us here. While we specialize in the touring and commuting arena, we also cater to road racing and cross country off road cyclists. Much of our own cycling is off road, though Linda and I both enjoy road riding on our singles as well as on our tandem. We offer products that make the practical use of the bicycle easier and safer. Many people don't know that good lights are available to make riding at night much safer and more fun. That's why we're here. We keep a large inventory of components and parts on hand from Wilfried Schmidt Maschinenbau, Spécialités TA, Carradice, Busch & Müller, Stronglight, Velocity, Pitlock, Tout Terrain, Gilles Berthoud, Supernova, Rohloff, Paul Components, Campagnolo, Shimano, Phil Wood, Mavic, White Industries, Ortlieb, Tubus, King, Schwalbe, Nokian, Wheelsmith, Brooks, Camelbak, Zefal, SKS, Nitto and many others. We don't have parts for BMX or other children's bikes. We don't have parts for Huffys or any bikes sold through department stores. Nor do we have specialized components for "Invalid Bikes", you know, for those poor unfortunate people with green or pink hair who have to be carried up the mountain on a ski lift so they can ride down yelling "Yo Dude!" Yeah, I know, that violates the Americans with Disabilities Act. I'm a heartless scoundrel. Make the world a better place and turn me in by clicking here. We do a brisk business building Tout Terrain bicycles and wheelbuilding. 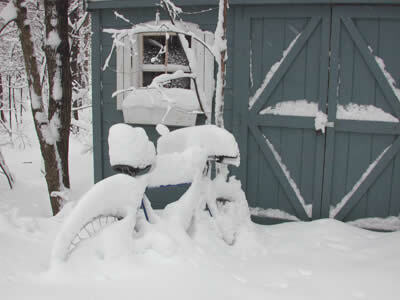 We don't offer general service on bicycles. 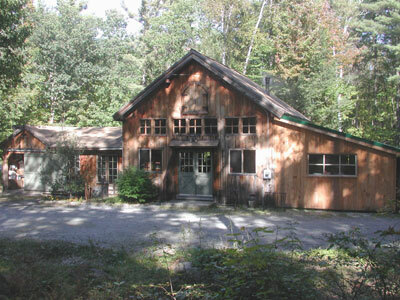 The shop is in Hillsborough, New Hampshire, a small town midway between Concord and Keene. From the east, Concord, take Interstate 89 North to Exit 5. It's a left lane exit. Don't ask why. Follow Route 9 West to Route 31 and turn right. You're now heading north towards Washington. Hall Rd. is a dirt road on the left, 1.3 miles north of Route 9. If you go past William's Store on the left, you have gone too far, by about one hundred yards. From the west, take Route 9 eastbound from Keene. Watch for Route 31 to merge with Route 9 from the south. About 2 miles later, Route 31 will leave Route 9. It's a left turn, heading north towards Washington. Hall Rd is 1.3 miles on the left. If you're coming from White River Junction, VT. follow Interstate 89 south to exit 5, pick up Route 9 west and then follow the directions as if coming from the east. From the south, take Route 202 North from Peterborough until it intersects Route 9 in Hillsborough. Then take Route 9 West as if you came from Concord. Route 31 north is just 1.5 miles away. From the north, well, hardly anybody ever comes from the north. There's just polar bears, tundra, and a few old fur trappers who've perhaps spent too much time in the wilderness. But, after crossing the glacier (watch out for that last Bergschrund, it's a whopper), take Route 10 south from Newport, (Don't ask where the mansions are. People will look at you funny.) bear left onto Route 31 south, and after you cross the Hillsborough town line watch for Hall Rd. on the right just past William's Store. Please call for an appointment, in particular if you need to speak with me, the guy with the grey beard. Since the main highway (Route 9) through town was re-routed in 2002, many maps even now are not accurate, including some on-line mapping software. Follow these directions, not your map. Besides, the maps never show the Bergschrunds. Also, some maps show Hall Rd. going all the way from Route 31 and connecting directly to Route 9, west of the point where Route 31 goes north from Route 9. Unless you're on a mountain bike or are hiking the AT and gotten lost, don't try to come up Hall Rd. from the south. The middle of Hall Rd. is barely navigable in a tracked vehicle, but lots of fun on full suspension mountain bike. Yahoo Maps is up to date. Click here for a map. Here's the old shop on a busy day. If you'll be dropping in by hot air balloon (no jet packs please, you'll disturb the wildlife), here are the coordinates. N 43∞ 7' 29.5" - W 71∞ 58' 9.0"
Peter keeps banker's hours so he's typically in the shop from 10AM to 4PM Monday through Friday, eastern time. Linda, Sheena and Penny are in the shop from 9AM until 5:30PM. Late in the day we're rushing to get Fedex orders packed for the driver, so it's best to call before 4PM. We're not open regular hours on weekends. But I often make appointments to see people. It's best to set a time a day or two in advance if you want to come by on Saturday or Sunday. By the way, I received an email a while back from a prospective customer who says he doesn't like the way I write, and therefore he's not going to buy anything from us. So I'm going to try to improve my writing and I've decided to use the following paragraph as a guide. I'm hoping it helps us get more business. This was written by a really smart college professor from Berkeley.